The 402-FA includes a Reamer for 1/4" - 5/8" Tube. The 400-F Forms 37° flares to government specifications in steel, stainless steel (including MIL-T-6845), titanium and other metal tubing. 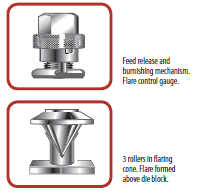 Positive stop gauge assures correct size of flare. Special burnishing action polishes flare face. Three rollers in flaring cone roll out 37° flare above die block. Roller action cuts effort required; maintains original wall thickness - eliminates stress concentration. Reaming yoke for 1/4” to 5/8” O.D. tubing. Fits onto 400-F Flaring Bar. Recommended for use with steel and stainless steel tubing for proper flaring. 664-FH Tube Lever Bender Range with Roto-Lok™ for 1/4", 3/8" & 1/2" O.